Last night North Yorkshire County Council approved Third Energy’s application to frack the village of Kirby Misperton, going against the wishes of 4375 residents and the interests of millions of people suffering the effects of climate change across the world. On the weekend that we celebrated keeping the UK free of fracking for five years, this is a disappointing and short-sighted decision. But one thing is absolutely certain – the fight is far from over. 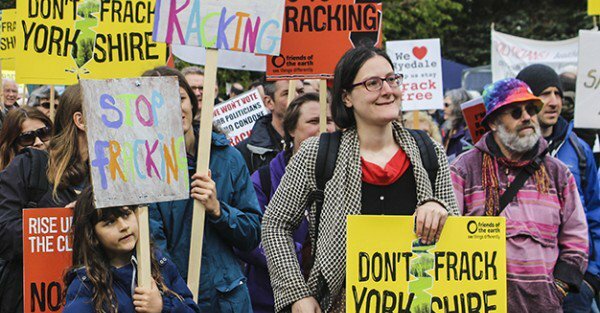 On Friday I made the journey to Northallerton to join hundreds of anti-fracking campaigners at a rally outside North Yorkshire County Hall, where members of the affected communities were giving evidence to their councillors. Over the course of the day around 75 people presented well-researched, scientific and passionate arguments about why they didn’t want their beautiful countryside to be fracked. We braved out the morning rain and stood together in a show of solidarity that lasted all day and can have left the councillors in no doubt about the level of public opposition to these plans. The numbers speak for themselves: the council received 36 responses in favour, 4375 against. There was a constant din of cars honking their support as they drove past. During breaks in proceedings we heard from local people, ate cake from the anti-fracking nanas and had a rousing singalong to some special anti-fracking songs. One of the most exciting things for me was the way that affected communities from across the country had come together to stand shoulder to shoulder with the people of Ryedale. Frack Free Lancashire brought their double-decker bus over the Pennines to support their counterparts in Yorkshire. White and red roses abounded, and rarely have I felt as inspired as when the Lancashire and Yorkshire nanas joined forces on stage and sang their hearts out. This is what real community activism looks like: most of these people are not seasoned campaigners; they’re local business-owners, farmers, parents, grandparents from across the political spectrum. This isn’t about protecting one area, it’s about a powerful grassroots movement united by a fury at the way establishment interests are trying to force unwanted development onto ‘the desolate north’ without the consent of its residents. People are sick of being ignored and taken for granted by an entirely disconnected political elite, and they are fighting back. This was never going to be an easy battle. Legal options are currently being considered and activists across the country are resolving to fight tooth and nail, for as long as it takes. Stand with them and sign the people’s declaration here.